Hardwood floors are designed to take on a lot of wear and tear – from pets and kids running through the house to those cringe-inducing spills that spread an entire dinner dish across the room. Thankfully the resilience of a hardwood floor makes it relatively easy to clean and maintain. When dirt and grime start to show and the gleam of your floor fades, it doesn’t take much to restore the luster. Even an older floor, like those from late 19th and early 20th century homes, can be cleaned and quickly restored. That’s one of the most attractive benefits of wood floors; depending on the wood and the finish, they can last upwards of 25 years. With the right care, cleaning, and maintenance the hardwood in your home can last a lifetime. But properly cleaning a sealed wood floor isn’t as simple as running a broom around the room or activating your Roomba. It’s easy to damage your floor by using the wrong tools or products. Here’s how you can keep your hardwood floors clean to maintain their rugged, natural beauty. While a variety of wood types have been (and still are) used for hardwood floor installation, the type of wood has very little to do with how you clean the floor. Instead, it’s the finish that dictates how you’ll clean, vacuum, and maintain your floor. According to Bob Vila, there are two types of finishes traditionally used to seal the boards used in hardwood floors: surface finishes and penetrating finishes. Surface finishes such as urethane and polyurethane form a protective waterproof barrier on the surface of the floor. This finish offers more protection than penetrating finishes but when the finish gets scratched or takes damage that gets into the wood, exposure to moisture can further damage the floor. Penetrating finishes such as linseed or tung oil soak through the surface of hardwood floors, and then are usually topped with a wax coat for added sheen. These finishes easily absorb water, and water can warp wood floors, so use only solvent-based cleaning products instead of water-based ones on floors with penetrating finishes. The easiest way to check if your floor has a surface finish is to take a sharp knife blade to a small, hidden area of the floor and scrape off a tiny amount of finish. If the scraped material is clear, your floor probably has a surface finish. If scraping the floor finish smudges it, but no clear material comes away, your floor likely has a penetrating finish. Even for simple, routine cleaning it’s a good idea to know the finish of your floors because it will impact what you use to clean it. Once you’ve identified the finish, pick up the right products and get familiar with how to use them on your floor. Also be sure to pay close attention to the products you need to avoid if you want to prolong the life of your floor. The right broom – Don’t be tempted by a dollar store broom or the traditional straw brooms. These can scratch and dull the surface of your floor over time. Instead, get a broom with softer synthetic fiber ends. These won’t scratch the floor and they do a fantastic job of trapping dust, dirt, pet hair, and more. The right mop – the mop you choose matters. A traditional mop usually attaches with metal hardware that can damage the floor. Traditional mops can also soak the floors or release too much water. This is especially bad for a penetrating finish but can still damage wood floors with a surface finish that has worn away over the years. You should also skip the steam mop. Moisture is the enemy of your floors and adding heat can do additional permanent damage. Go for a microfiber mop to clean your floor. Microfiber is great as an alternative for a broom (when you use it dry), and it works just as well when damp to clean the floor. The right vacuum – A traditional carpet vacuum isn’t recommended for wood floors. Ideally, you want a vacuum compatible with hard surfaces including a function to lift the beater bar (no brush, suction only) or have a floor brush attachment designed specifically for wood. Traditional vacuums use the beater bar and brush to kick up and dislodge dirt and dust in carpets. That same bar, true to its name, can beat on your floor and dent the wood. Instead of a traditional vacuum, use a stick vacuum or handheld cannister vacuum with appropriate attachments to pull the dirt and debris from the crevices of your wood floor, or spot-vacuum the piles of dirt once you’ve finished sweeping. With the right equipment it’s easy to set a routine for keeping your floors clean. Here’s a simple approach to get that first deep clean out of the way with recommendations on follow up and routine maintenance. Start by dusting, sweeping with a microfiber mop and vacuuming your floors. Mop the floor with the proper cleaning solution (surface-treated, not seal-treated; see below). Make sure to wring the microfiber mop out completely so it’s only a little damp and then mop with the grain of the wood. Replace your water when it gets dirty. a. A microfiber spray-and-mop product is a good alternative to a standard microfiber mop. Open windows and turn fans on (especially ceiling fans) to circulate air and help the damp surface of the wood dry much faster. Deep clean heavy traffic areas that don’t come clean with the above steps. Consider if it’s time to apply a fresh coat of finish or if your floor needs a sand and refinish. The Home Depot shared a simple chart to help plan cleaning frequency and when to perform maintenance on your hardwood floors. Here’s where knowing the type of finish of your hardwood floor is critically important- there are products that can ruin the finish if used improperly. Because the seal and finish are non-absorbent and only on the surface, you can’t use any cleaning oils or furniture polish sprays. They’ll remain on the surface and can leave a residue even when wiped away, making your floor incredibly slippery. You also want to avoid products that can damage that surface seal. Abrasive cleaners, alkaline products, and ammonia can all eat away and dull the finish of your hardwood floors. If you have a more recently installed floor, the installer and/or manufacturer can likely recommend a good cleaning product. If not, a simple mixture of soap and water will work. Be sure to use a pH-neutral soap and minimize the amount of water you put on the floor. Stick with a damp mop only. You do not need to mop seal-treated floors and you should avoid getting them wet at all costs. Instead, stick to sweeping and vacuuming your floor with a good stick or handheld vacuum. This is sufficient throughout the year to maintain the floor. Every 6 to 12 months you should use a manufacturer/installer approved stripper to remove the wax. 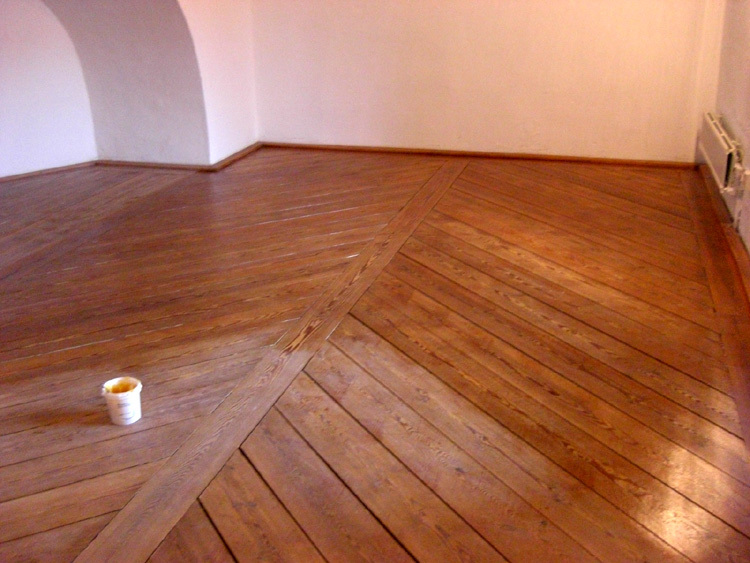 Before applying a new coat of wax make sure the floor has had time to thoroughly dry and then apply a new coat. If you notice some high traffic areas dulling faster than the rest of the floor you can spot-strip the wax and reapply a new coating in those areas. • Vacuum your floor every week with the right handheld vacuum, stick vacuum, or an upright with the beater bar disengaged. • Don’t be tempted to take shortcuts with furniture polish, they can cloud the finish of your floor. Be mindful of overspray while tending to your furniture since even small amounts can discolor your floor’s finish. • Be quick to wipe up any kind of spill, then use an approved cleaner to get up any remaining residue that you may not be able to see. • Reduce abnormal or excessive wear in high traffic areas by putting down extra-long door matts and carpet runners. Not only will they keep a uniform finish to your floor, long matts can trap additional dirt, debris, and water before they enter your home. • Get furniture pads for the feet of your furniture; choose the best-rated pads with fabric or felt bottoms to save your floors from scuffs and gouges. Even if you don’t rearrange often it only takes one accidental bump to carve a line in a wood floor and mar the finish. • Keep your handheld vacuums charged and ready to go so when you finish your regular sweep you can use your fully-charged vacuum to quickly finish the job. Looking for the perfect vacuum to help keep your hardwood floors shiny? Check out our reviews of the best handheld vacuums from today’s leading brands.